Group of teachers developed a four-year engineering career path that includes a host of Autodesk software products. Autodesk has a great product that helps teach students the math and science concepts necessary for their education and ultimately success, and that is why we keep it. Petaluma, founded in 1858, with a current population of nearly 60,000, is located in Sonoma County, just 32 miles north of the Golden Gate Bridge and less than an hour from the cultural heart of San Francisco. Headed by Superintendent Greta Viguie, Ed.D., Petaluma City Schools serves 7,781 students, from the city of Petaluma and surrounding areas. The student body make-up is 51 percent male and 49 percent female; 33 percent with minority ethnic backgrounds; and 17 percent participating in the free and reduced lunch program (signifying the amount of potential poverty). The district’s mission is to provide opportunities for all students to be challenged and motivated in school so that upon graduation, they will be successful in their future educational endeavors, careers, and community. The secondary district contains two comprehensive high schools—Casa Grande and Petaluma High, with 1,850 and 1,590 students, respectively. At Petaluma High School, Tom Richards, who has been teaching for 36 years, is part of the Industrial Technology Department, which provides quality educational programs related to economic and employment realities in the fields of engineering, design, and apprenticeship trades. On the east side of town, Don Billing, who has taught at Casa Grande High School for 28 years, is the sole instructor leading the Industrial Technology Department at his school. The main challenge for these Petaluma high schools is preparing teenagers for possible careers and/or further education. Petaluma has begun to look at career clusters, but as with most schools, the students in Richards’ and Billing’s classes don’t see a direct link between learning science and math and their potential careers. These instructors also want to make sure that they are teaching their students to think critically and provide them with the skills needed to see many different solutions to a problem. Richards and Billing have developed a four-year engineering career path that includes AutoCAD, Autodesk® Inventor™ Professional, and Revit® Architecture software products from Autodesk. During the first year, students begin by sketching, lettering, and board drafting. Next, they spend the rest of the year building the skills to use AutoCAD. These lessons include Basic Drafting, Orthographic Projection, Geometric Construction, Dimensioning, Lettering, Sectioning, Auxiliary View Drawing, and Isometric Drawing—all focused on 2D. During Richards’ Architecture class, students are introduced to architectural design using Revit Architecture. The course begins by exposing students to the role of an architect, the various architecture opportunities, and guest speakers from local architecture firms. The final project requires the students to design and build their 3-bedroom, 2-bath dream home, within a budget of $400,000. They are given the different cost-per-square-foot for individual parts, such as a deck, a bathroom, and a garage, and they must design the house within the measurement parameters and budget constraints. 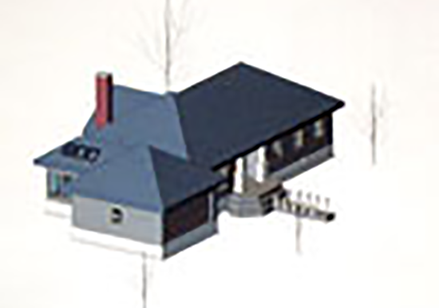 For his Architecture class, Billing uses Revit Architecture and asks his students to design a single-story house of their choice. Billing focuses on manufacturing using AutoCAD and Autodesk Inventor Professional software. He instructs students to design an assembly part first as a sketch, with correct measurements, and then re-create it as a 3D computer model. “I first teach them the basics in AutoCAD, and then introduce Inventor. There are many more capabilities in Inventor, and the design is much cleaner and clearer. Students like Inventor, because they can do more with their assembly part in this application as opposed to a basic 3D modeling program,” notes Billing. For his Manufacturing course, Richards starts students off by introducing sketching and geometric constraints in Autodesk Inventor. Students begin by modeling a single part in 2D and quickly evolve to very advanced concepts, such as extrusion (making something that’s 2D into a solid or 3D); revolving features, such as a rim on a car; and sweeps and lofting, for building a model ship. They design a product with multiple parts and make an orthographic drawing—using animation to explode the parts in sequential order and collapsing them into an assembled part. “Teaching my students how to dimension correctly is extremely important. In the real world, parts for a finished good are manufactured all over the world and yet need to be assembled in one physical place. Of course, congruent parts must match and fit together for the product to be functional. These complicated concepts, called geometric dimensioning and tolerancing, must be done correctly in working drawings using Inventor, and are critical to ensuring a successful assembly. Understanding these concepts helps students excel in math,” says Richards. Both teachers focus on a hands-on project where the students build one of their designs. Billing’s students construct the model houses that they designed. And Richards takes the manufacturing process to the machining stage—showing students the type of cuts and machines that are used to assemble a part. And in Richards’ class, students shadow a mentor in a career field so they see how they can use what they are learning in class. Billing observes that employers and parents are very impressed with the Industrial Technology programs at the two Petaluma high schools. Employers see the students who take his courses as highly eligible for employment, and parents view Billing as highly credible because of the depth of his courses. For students, one of the best advantages of these courses is having their Autodesk-based projects submitted to local fairs and competitions and earning actual prizes and prize money. Two of Richards’ students won First Place and Outstanding Project Recognition at the California State Fair last August for projects using Autodesk® Revit® 9 software, while two of his SkillsUSA Automated Manufacturing teams using Autodesk Inventor Professional received Second Place and Third Place. Parents are very appreciative, as well as surprised, that their children’s schoolwork is recognized and valued, both monetarily and conceptually. To learn more about Autodesk’s academic solutions and programs, visit www.autodesk.com/education. To learn more about Petaluma City Schools, visit www.petalumacityschools.org. To learn more about SkillsUSA, visit www.skillsusa.org.